At the end of 2017, Google launched the Pixel 2 and the Pixel 2 XL, a pair of phones that were immediately established as two of the best phones you could buy. Earlier this year, OnePlus countered with the OnePlus 6, which has also been very well received since. Here we're going to put the bigger (and more expensive) of the Google phones up against the new pretender to see how they compare against each other in design, specs, features and more – if you're thinking of buying one of them, then this guide should prove helpful. These are two fine-looking smartphones, all polished and sleek – the OnePlus 6 has glass front and back, with your choice of matte or glossy finishes, whereas the Pixel 2 XL goes for a more textured, plastic backing. Both look and feel great – especially the white models you can get with both handsets. At the front the OnePlus 6 has a display notch that the Google Pixel 2 XL doesn't – a notch that you can hide in the software settings, if you don't like it. Both phones have done a very good job of banishing bezels off to the side of the device, but they're definitely smaller on the OnePlus 6. The OnePlus 6 has a slightly larger 6.28-inch screen, though the actual phone is smaller than the Pixel 2 XL. That screen has a 1080 x 2280 pixel resolution, a rather unusual 19:9 aspect ratio – this really is a tall screen (or a wide one, if you're holding it horizontally). As for the Google Pixel 2 XL, that has a 6-inch screen with a 1440 x 2880 pixel resolution, making it sharper than the OnePlus 6. The display has a more conventional aspect ratio of 18:9, so it's not quite as elongated as its rival. The Google Pixel 2 XL arrived in 2017, and like many phones of last year, is powered by a Snapdragon 835 CPU chipset. The OnePlus 6 launched in 2018 and has the 2018 upgrade – the Snapdragon 845. The newer chip is faster, but not by a huge amount. Other than that, you can get 6GB or 8GB of RAM with the OnePlus 6, as well as 64GB, 128GB or 256GB of internal storage (there's no memory card slot for expanding that). With the Pixel 2 XL, you've only got 4GB of RAM, plus 64GB or 128GB of storage. Again, there's no card slot for expanding the available room. On paper then, the specs of the OnePlus 6 are a significant step up from the specs of the Google Pixel 2 XL – perhaps to be expected, given the seven months between the respective phones being announced. The Google Pixel 2 XL is no slouch, and will power along very nicely, but the OnePlus 6 has even more oomph behind it. As for cameras, the dual-lens 16MP+20MP rear-facing camera on the OnePlus 6 is up against the single-lens 12.2MP snapper on the Pixel 2 XL. Given the quality of the Pixel camera and Google's image processing software, though, we'd say the Pixel 2 XL is probably just ahead in this department. What else is there to talk about? Well, if you've shelled out a lot of cash for a pair of wired headphones recently, then you'll want to know that the OnePlus 6 keeps the traditional 3.5mm audio jack, whereas the Google Pixel 2 XL does away with it, and goes USB-C only (you do get a USB-C-to-3.5mm adapter in the box, however). Then there's wireless charging – neither of these phones feature it, so you need to get the OnePlus 6 and the Google Pixel 2 XL cabled up if you want to charge them. The OnePlus model features the fabled OnePlus quick charging mode, so it's probably a better bet if you need to juice up your phone quickly. With an IP67 rating, the Google Pixel 2 XL shades the waterproofing and dustproofing comparison. OnePlus hasn't given its phone a rating, so any kind of dunking is likely to ruin it. It's perhaps not a dealbreaker, but something else to bear in mind if you're trying to choose between these two handsets. The Pixel 2 XL features the stock version of Android – clean, fast, secure, regularly updated – with some Pixel extras added by Google. The OnePlus 6 features the OxygenOS version of Android made by OnePlus, which is actually very nicely done as well: though maybe not updated as quickly as Android on the Pixel phones. 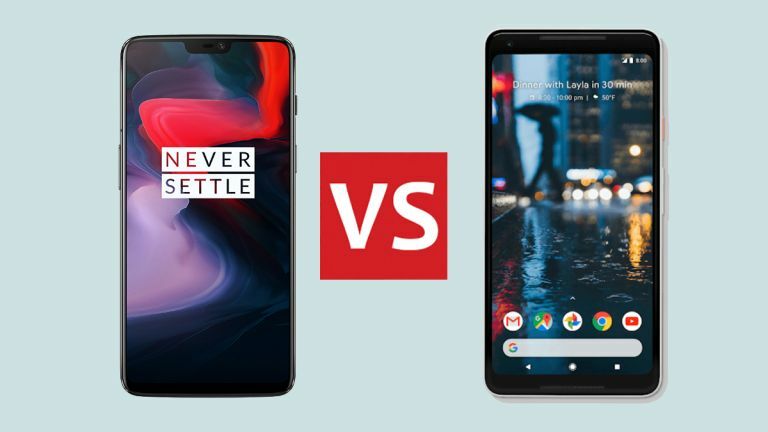 Trying to put these two phones head-to-head is perhaps a little unfair on Google, because its handset is more than half a year older than the OnePlus 6, and it shows. Google will get chance to hit back later this year with the Google Pixel 3 and Google Pixel 3 XL. With that caveat in mind, the OnePlus 6 is better in pretty much every department – in the raw specs, in the look and feel of the device, and in the various configuration options you can get. It really is one of the best phones of 2018 and is priced very competitively as well. So why would you still get the Pixel 2 XL? If you want the fastest updates from Google, perhaps, or want the best photos possible – the Pixels still lead the pack in terms of mobile photography. With a replacement around the corner, you might be able to get a decent deal on a Pixel 2 XL now as well, though the OnePlus 6 will probably still offer better value. All in all, these are two fantastic phones, both definitely up there as the best of the last 12 months. The OnePlus 6 really benefits from being the newer model though, and is likely to be a better bet at the moment for most buyers, apart from the Google loyalists.